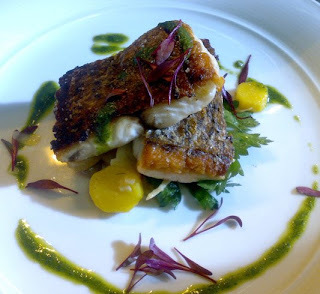 Pilu at Freshwater: A long needed update! 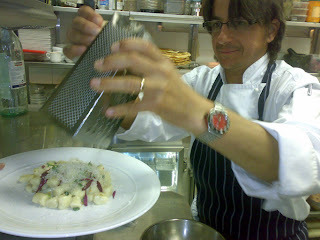 Giovanni, hard at work on a saturday night. 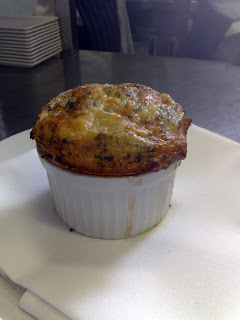 Zuppa galurese. A Sardinian bread pudding. 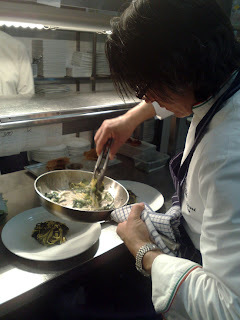 Consisting of, lamb stock, mint, pecorino and of course, bread. 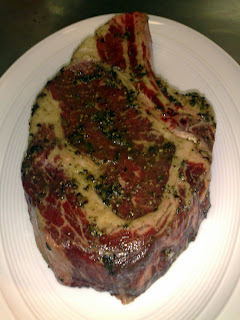 A before shot of a 1 kg black angus rib eye steak. 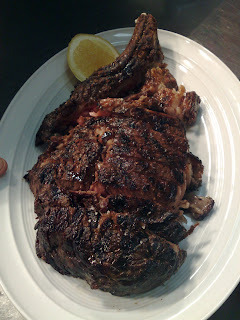 Now, Ready to eat, for two to share ! 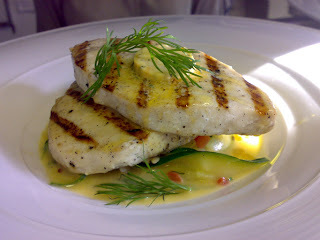 Pan seared swordfish, with assorted saute seasonal vegatables. 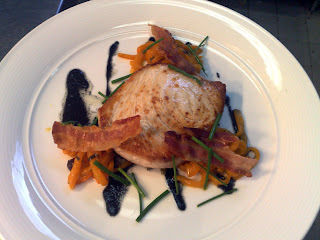 Swordfish with roasted orange peppers, crispy pancetta, chives and squid ink dressing. 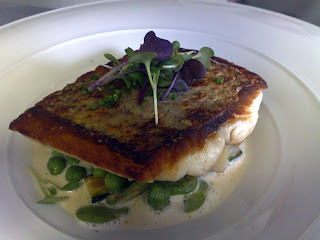 Oven Roasted Hapuka, sitting on fresh peas, new season broad beans, baby zuchinni and a fennnel cream. 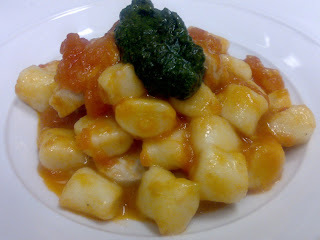 Potato gnocchi, with a fresh ox heart tomato sauce, yellow fin tuna pieces and pesto. 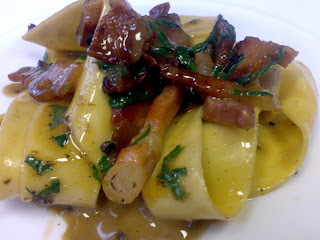 Truffled egg pappardelle, porcini's , pancetta and parsley. 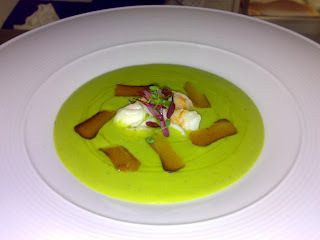 Pea and ham soup. shaved bottarga and poached king prawns. 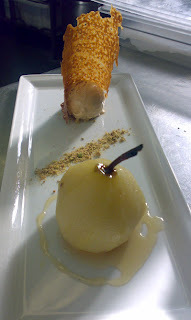 Vermentino poached honey pear, with ginger-caramel gelato and sesame wafer. 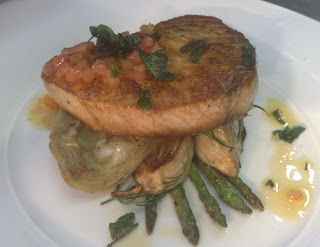 Assigini! 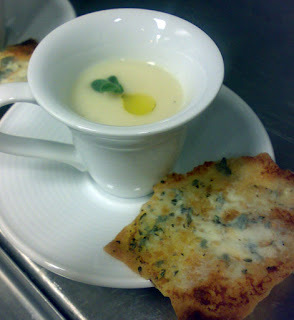 Cream of celeriac soup, and gorgonzola carta di musica crustini. 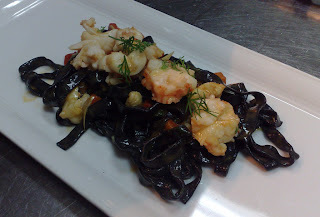 Squid ink fettucine , marron tail and dill. 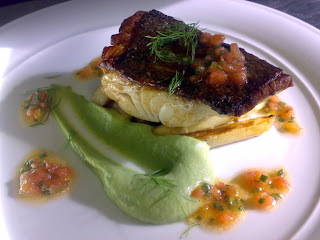 Pan seared Blue eye, on saute white asparagus, with fennel puree and a tomato and chive dressing. 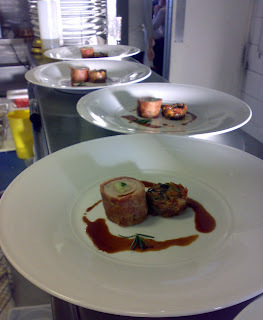 Rolled pork fillet, accompanied by eggplant caponata, made for a friend recently. 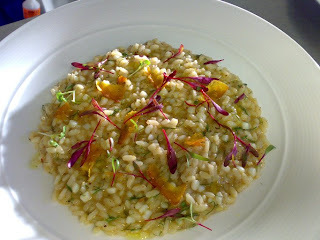 Risotto of squid, fennel and bottarga. mmmmmm mmm mmmmmmmmmmm. 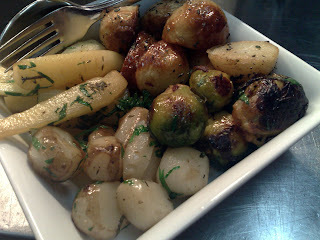 must go in again some time soon... birthday treat perhaps?